This recipe for Oreo balls (or Oreo cookie truffles, if we’re being fancy) is a total classic and a must for holiday cookie trays! Oreo crumbs + cream cheese + dipped in chocolate = heaven. We’re nearing the halfway mark in December, which means that the world is in the throes of holiday party-ing! Right? I actually don’t know because we have two kids under three and my idea of a party right now is some chocolate after bedtime, curled up on the couch, and Netflix, HA. But I think most people are out enjoying holiday festivities by this point, and I love nothing more about the holidays than putting together an epic cookie tray to bring along whenever we visit friends or family. A must for holiday cookie trays? Oreo balls. They are classic, old-school, throwback, no bake, EASY, and crazy delicious, which is why people absolutely devour them. All you need to make these Oreo balls are four simple ingredients: Oreo cookies, cream cheese, chocolate chips, and vegetable shortening. 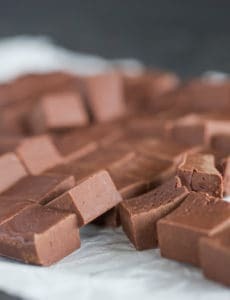 Most of the recipes claim they are only three ingredients, but I always, always, always add vegetable shortening to my chocolate when I’m melting it for coating, as I’ve found it creates a much smoother, less clumpy coating than chocolate alone. Simply crush up the Oreo cookies (a food processor is ideal for this, but if you don’t have one, a rolling pin will do the job!) and mix in the bowl with the softened cream cheese. Then scoop the mixture out into balls, let them firm up in the fridge, then dip in chocolate and decorate. They keep for weeks in the refrigerator and can be frozen as well, so they’re a great recipe to make in a batch and keep on hand for the entire season! They’re so super simple, and Joseph loved helping me with these… a great recipe for involving the kids! You can whip up a batch of these now and then keep them in the refrigerator right on through the new year. They do tend to get soft if they sit at room temperature for hours on end, so you’ll want to keep them in the refrigerator until serving or assembling your cookie plate. Halloween Oreos with orange sprinkles! You now have absolutely no excuses for not making Oreo balls… anyone you serve them to with thank you! Oreo crumbs + cream cheese + dipped in chocolate = heaven. Line a baking sheet with parchment paper and set aside. 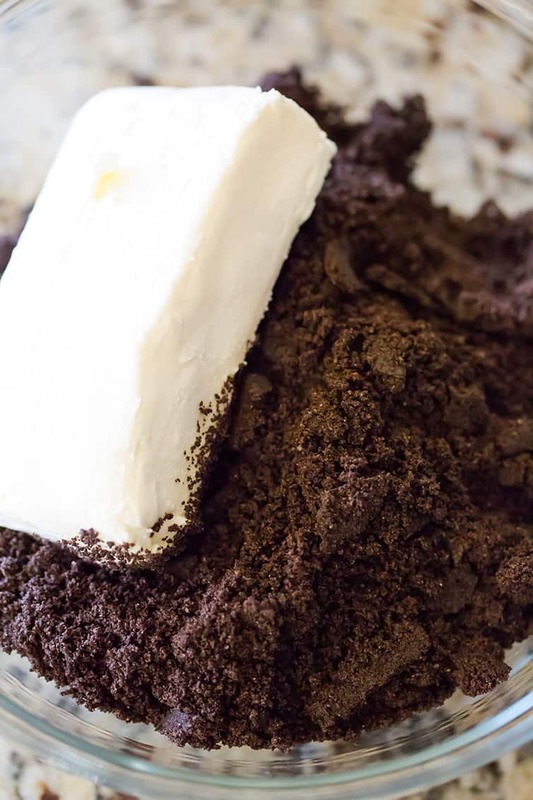 In a large mixing bowl, combine the Oreo cookie crumbs and the cream cheese. 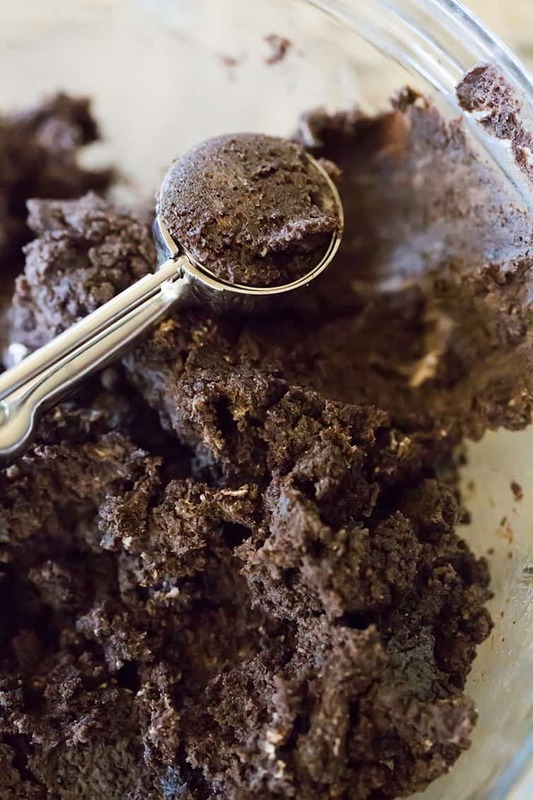 Using a spoon or spatula, press, mix and stir until the cream cheese is completely mixed into the Oreo crumbs and you have a soft, homogeneous mixture. Using a small cookie scoop (or the equivalent of 2 teaspoons), scoop out the mixture and place on the prepared baking sheet. Gently roll each into a smooth ball and return to the baking sheet. Refrigerate the baking sheet for at least 30 minutes, or until firm. In a small bowl or 2-cup measuring cup, microwave the chocolate chips and shortening in 30 second increments at 50% power, stirring after each, until completely melted and smooth. 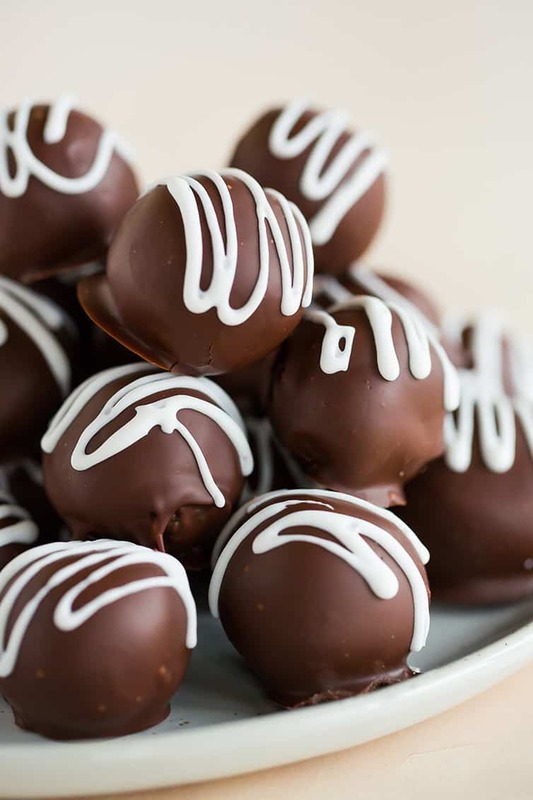 Working with one Oreo ball at a time, dip it into the melted chocolate, roll it around to cover completely, and then use a fork to remove it from the chocolate, letting any excess drip off. Place the dipped truffle back on the wax paper-lined sheet. Repeat with all truffles; once finished, return the baking sheet to the refrigerator for another 30 minutes. Serve the truffles, or garnish with some melted white chocolate. Store in an airtight container in the refrigerator for up to 2 weeks (or freeze for up to 2 months). Use the entire Oreo cookie (including the filling) for this recipe. You can substitute refined coconut oil for the vegetable shortening if you prefer. This recipe was originally published on December 6, 2011. Made these this afternoon for the Christmas Eve cookie tray. Just tried one and it was quite yummy. I made a bit of a mess when I dipped them in the melted chocolate chips – my chocolate was a little thick and didn’t really drip off. I had added only 1 T of vegetable shortening; I think I needed that second tablespoon to thin out the chocolate just a little more. I drizzled melted white chocolate chips over the top. I’m already thinking about what I’ll do differently next time – different coatings, different drizzles, maybe some sprinkles. Fun recipe! FINALLY made these… Delicious. But what are the tips for dipping in chocolate? Mine look like Pinterest fails! 😂 I used a fork and let the excess chocolate drip off but I still had marks on them. Also, we topped ours with flake sea salt. Mmmm. Hi Jen, So glad you loved them! As for dipping in chocolate… did you use the shortening? I find that without it, the chocolate gets “gloppy”. I made these with chocolate oreos for Christmas and today trying with peanut butter oreos. I’m adding peanut butter powder to punch up the peanut butter. Haven’t decided whether to dip with white chocloate, semi sweet or melted peanut butter chips. Maybe a few with this and a few with that! They taste best served cold. Very easy and everyone loves them!! Thank you for the recipe!! These were outstanding! Thank you! I’m thinking of making them again, and dipping one third in bittersweet chocolate, one third in white chocoate, and the rest in semi-sweet chocolate as called for in the recipe. Perfect for a holiday potluck! It’s so easy to make. Thank you for sharing the recipe! I guess I will ask the kids to try this recipe with me. It must be fun. These are sooooo good! This is the second year I have made them. So easy-used dark melting chocolate for the coating. Just read a new twist on these favorite cookies. We are trying them this weekend. Cut cream cheese from 8 oz.- 4 oz. and add 1/2 c. Nutella. Everything else (not that there’s much) remains the same. Yummers!! Ooooh that sounds delicious! Thanks for sharing! Can these be frozen? And I yes, for how long? Hi Shaina, Yes! I would say about 2 months. Enjoy! I make these for my husbands work around the holidays and everyone loves them. I use Ghirardelli melting chocolates and they melt beautifully with no shortening. The chocolate is smooth and sets up great! My husband wants me to try the mint Oreos next time. Hi Amy, Thanks for mentioning the Ghiradelli melting chocolates; I’ve seen them at the grocery store but haven’t tried them yet. Will use them for my next batch of these! I just brought Oreo truffles to my 1st of 2 cookie exchanges this week! I used Ghirardelli’s bittersweet baker’s chocolate with a double broiler method (just a glass bowl over simmering water in a pot) and it was the smoothest dipping experience I’ve ever had with truffles. They were a huuuge hit (I topped with red and white sprinkles for festivity) and were all gobbled up. The recipe made ~45 total truffles for me. Yum! Aren’t they so delicious and easy! And you’re right – perfect for cookie exchanges! Michelle, I’ve found that coconut oil can be used instead of shortening when coating cookies & candy. Yes, you’re correct! That’s in the notes just below the recipe. On the Oreo Balls you suggest using vegetable shortening when melting the chocolate. Do you mean something like Crisco or a liquid vegetable oil? Thanks much in advance. Can’t wait to try them. Hi Doris, Yes, I use Crisco solid vegetable shortening. Enjoy! What a great idea! Love how easy they are to put together. They are perfect as a Christmas gift! SO easy! And they are perfect for homemade gifts! Thank you for posting this recipe. It looks great and really temtping. I too have two kids and I know they would love it. I have a question though regarding the oreo cookies. By crushing them is it meant the whole cookie with the filling or just the outer dark layer? Thank you. Hi,i want to make truffles for my sister’s birthday but she is allergic to cream cheese so can i replace cream cheese with butter instead? Hi Lynn, Oh no I’m sorry for your sister! However, you definitely cannot replace the cream cheese with butter, it would be pretty gross! 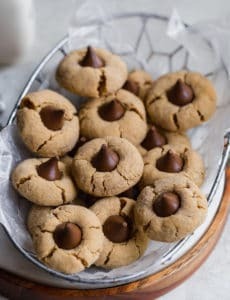 Hi Lynn, I saw on a couple of other websites for the same truffle where people used liquid french vanilla creamer in place of cream cheese…just kept adding a little creamer at a time until the cookies could be formed into balls. I think they said it ended up being about 4 – 5 Tablespoons. Everyone said it worked well and they don’t require refrigeration apparently without the cream cheese. I will be trying this at the end of the month and will let everyone on this site know how it works out. Hey look, it’s so delicious. 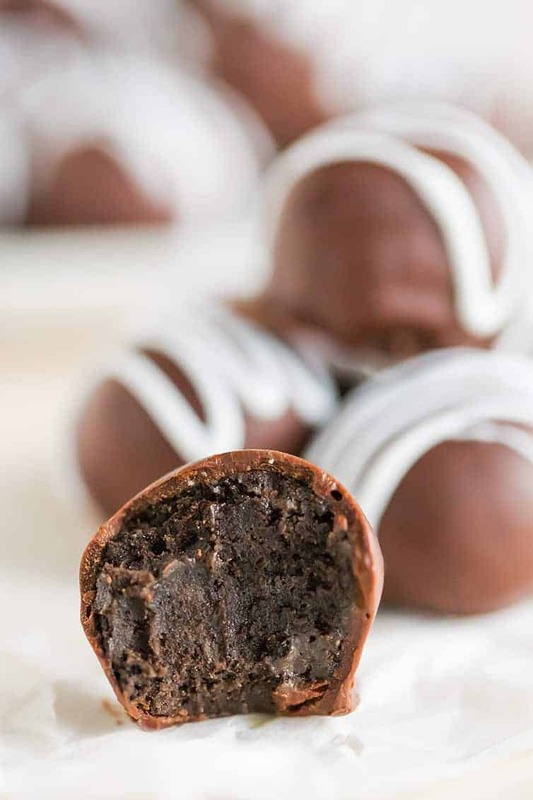 Thanks for sharing all the steps for making Oreo cheesecake truffles. I will surely try this at home for my family. Hi, I barely came across your recipe today! I’m planning on making some tomorrow. Would it be okay to use cream cheese spread instead of cream cheese? Thanks! Hi Daisy, I would use regular cream cheese; the spread may be too soft for this purpose. What would I have to change if I got the double stuffed Oreos instead of the regular ones? Would I have to decrease the cream cheese amount or just omit it altogether?? Hi Viktoryia, I would just proceed with the recipe as-is and do not make modifications. This is one of my favorite recipes! I love making it. So easy and so delicious. Do these have to stay refrigerated until served or can they last at room temperature for a few hours? They can stay at room temperature for a few hours. At long last, I finally made these, and posted them on my blog today. Perfect for Valentine’s Day. They’re luscious and chocolatey, and were a bit time consuming but fun to make! I’ve used ‘Bourbon biscuits’ (a type of cookie in the UK) to make these Oreo Truffles in the past if I haven’t been able to get a hold of Oreos. I tried this recipe with dark chocolate instead of semi sweet. The taste was great but I think I was expecting a lovely crunch. But instead, the truffles melted into your mouth which isn’t a bad thing. I think i would’ve liked it more if something in the truffles gave it a nice crunch. Maybe I should have put nuts in the truffles or made wafers to go with it. Have you tried making wafers, and could you direct me to your recipe? Hi Myra, I have not made wafers, so unfortunately there are no recipes here on the site for them. I’m planning to make these tomorrow for my mum’s birthday on Saturday. Hopefully this won’t be too sweet because my mum doesn’t like too much sweeties. Do you think i could use dark cooking chocolate instead of chocolate chips? This would make it a bit bitter so maybe I’ll add a bit of fine sugar. Hi Myra, You could certainly use dark chocolate in place of semisweet, but I wouldn’t add any sugar to the coating – it will keep it from melting and coating smoothly. 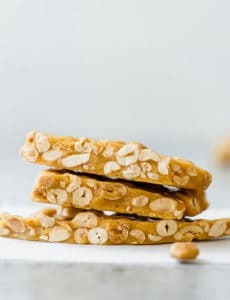 I’m not much of a candy maker… so, I’m asking, if you make them ahead of time and refrigerate – does the candy finish stay smooth or turn “chalky”? Hi Holly, It stays nice and smooth. I made a batch and kept them refrigerated for at least 2 weeks over the holidays, bringing them out for cookie trays as I needed them, and they stayed really nice.